This purifying treatment consists of steaming, exfoliation, and an intense deeper cleansing of clogged pores. 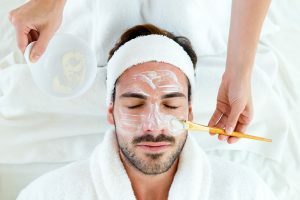 The skin is gently massaged, then a skin specific mask is applied. Beneficial and customized for all skin types. 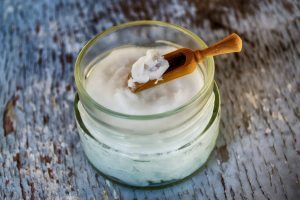 Fight aging signs while preventing razor burn, sensitivity, and folliculitis. Specifically for men, this in-spa treatment delivers dynamic results. Have a beard? We’ve got you covered! improve skin concerns: acne, hyperpigmentation, and aging. All peel treatments include The Post-Procedure Solution ($38 value). days following a professional treatment to increase visible results. antibacterial action, making it an excellent choice for helping to calm rosacea, as redness and inflammation can subside substantially after treatment. hydroquinone. It will help to quickly lighten pigment discolorations of any kind, such as melasma and actinic damage. In addition, this peel helps inhibit acne and correct post-inflammatory hyperpigmentation from acne. The hard to reach back area needs cleansing and pampering too! This treatment includes exfoliation, aromatic steam, deep pore cleansing, and a pore refining mask. This relaxing and beneficial treatment includes a massage of the hands, feet, neck and back. Rough or dull skin? This pain-free procedure manually exfoliates the skin, eliminating dead skin cells along with the “peach fuzz” on your face. There is no down time and the results are immediate with smoother skin and a glowing appearance. Reduce the appearance of wrinkles, acne scars, blackheads, and sun damage with this effective enrichment. This is a non-invasive exfoliating procedure that simultaneously uses diamond tips and suction to break up dull, dead skin and clean away debris thereby evening texture and tone while stimulating collagen production. *Recommended in a series of 3 to 6 spaced approximately 14 to 21 days apart and then continued one time every 4 to 6 weeks for maintenance. This non-surgical face lift works well around the eye, mouth, and forehead areas to reduce puffiness, fine lines and wrinkles. This will strengthen and tone loose muscles around the cheeks and jawline giving a firmer appearance. *Results (short lasting) after one treatment (great for a special event). Most see significant improvement (long lasting) after 10-15 consecutive treatments. We have four light therapy options. Enrichment is effective after 10 minutes and highly beneficial at 20 minutes. Blue light reduces acne bacteria and inflammation. Red light reduces fine lines, increasing collagen production. Green light reduces hyperpigmentation/sun spots. Amber(yellow) light reduces redness/rosacea. This device reaches deep under the skin penetrating underneath the facial muscles. The probes perform work to drain toxins and lift the skin, which feels warm, but not uncomfortable. 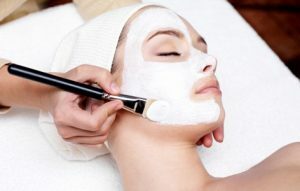 * A series of 5-6 facials with the addition of the best skin enrichment treatment is recommended for optimal skin health.